Visual Assist build 2068 introduces Add Braces and Remove Braces–commands that simplify converting of a statement to a compound statement, and vice versa. The most efficient way to use the feature is to bind a shortcut to VAssistX.BracesToggle, which as its name implies, will add or remove as appropriate. The only nuance to the feature–to avoid breaking code–is that the commands are available only on single statements, even “compound” ones. For those who embraced VA Hashtags, which we introduced in our last build, you will be pleased to know build 2068 allows hiding of hashtags. 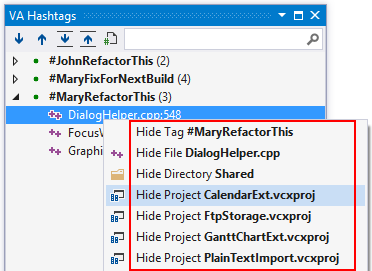 Open the context menu of the VA Hashtags tool window for an assortment of hiding options, including hiding by tag, file, directory, and project. You can hide from the current solution or all solutions. Finally, several dialogs that support filtering now interpret comma to mean logical “or”. This means “binary, base64” finds files containing “binary” or “base64”. You needn’t search separately. Learn more about Add/Remove Braces, see what you missed in VA Hashtags, check out the complete list of what’s new, or download the installer. If you use Visual Assist, you are probably familiar with its Quick Refactoring Menu—available via a hovering icon or the default shortcut (Shift+Alt+Q). But, you might not appreciate how frequently the menu is available. Quick Action Menu is a more apt name. Available actions in the Quick Refactoring Menu depend on what Visual Assist thinks you might do and where you are: in whitespace, in a symbol, or with a selection. 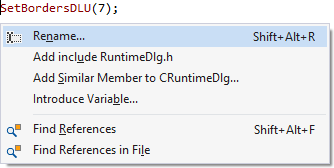 Browse the following list of actions that can appear in the Quick Refactoring Menu. Look for unfamiliar actions and envision scenarios in which they make sense. Try a few and add them to your arsenal. If you can’t fathom when or where an action might be available, click through and find an answer in documentation.